It's A Beautiful Day--And I Was Off To Enjoy It! What a Wonderful Sweetest Day! Thanks for Commenting for Charity! This is as dressed up as I get - thank God! Our favorites were Batman and Robin. All of them were cute though. It was fun seeing all the dogs with their owners so proud of them. Do you dress your pets up? 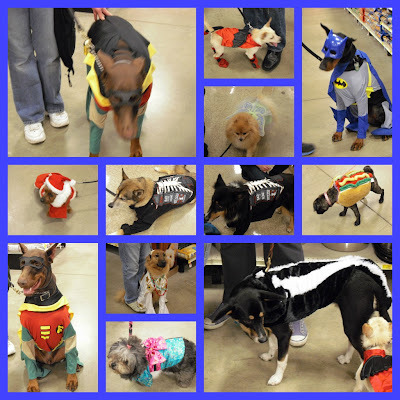 Stop by Bozo's Pet Pride and link up your pet post! Thanks to a bone density test I had scheduled for last Wednesday, I was off work and could enjoy the gorgeous fall day outside with temperature at 78 degrees! I ran through my choices as to what outdoor activity to do in the afternoon among walking Abby at the park (I could join in on her walk with Gerard later), playing 9 holes of golf (I'd probably lose balls in the leaves and it cost money), or taking fall pictures at the zoo (free exercise). As you can see from the video, I picked the zoo and it was so relaxing and wonderful! It couldn't have been a more beautiful day! The zoo was practically empty. You can hear some voices in the background during some of the video, but as you can see from the pictures between exhibits, there are no people! It was very peaceful and relaxing. I didn't cover the whole zoo because I still wanted to get some reading in before Gerard got home to walk Abby, but I was there a little over an hour. I didn't get my camera ready in time to video the elephant squirting mud all over herself, it was fun to see! I'm so glad I went on Wednesday instead of waiting until Saturday because the rain came and the temperature dropped to the 40s by the weekend. Seize the day folks, enjoy the nice days outside while we can because you know, winter's coming. Usually Manny Boy lays on the chair while I'm at the computer, but Friday, Spunky Doodle beat him to it. This is one of the rare times when I could get a picture of all three pets together. We just found out over at Powell River Books Blog that TODAY is National Cat Day! Guess it doesn't really matter since EVERY DAY is Cat Day at our house! This is sort of funny to me since my mom's birthday was Oct. 29 and she didn't care for cats because she said they were quiet and sneaky and she didn't like the feel of fur. She would always jump if a cat came by her because she wasn't expecting it. Please visit Aww Mondays and Camera Critters. A pleasant word can be the start of happiness that warms a heart. You know Karen, I think if I knew you in real life I would get a real kick out of you. You are always making smile every time I come over here. You inspire me! When I read this, it was so encouraging to me. It was a little punch in the arm I needed to remind me why I blog and to keep going. Marlece is a mom of four boys and I enjoy visiting her blog as well. 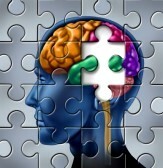 If you are not familiar with it, stop by and check it out. She has a really cool blog design too! I try to be encouraging with my comments too when I visit blogs. How about you? If you read and run without taking time to comment, that is okay, but leaving a comment lets the blogger know you appreciate their post and is a really easy way to brighten someone's day! Now, go be an encourager to someone today with your words! According to last Friday's Free Kibble game, cat owners are 40% less likely to have heart attacks than non-cat owners (yet another good reason to adopt a cat!) I was surprised that percentage was so high. I wonder if you have two cats, if it would go up to 80%? We donated candy and now we are off today so we can do our Saturday "run-around" so can can help set up and run games at Parma Heights Baptist Church fall festival. Lots of kids come in from our community and I always enjoy seeing their costumes and chatting with the parents. It's a fun day with lost of high energy! If you are in the area, stop in anytime between 12:30 and 3:00. Related post from archives: Church's Fall Festival Brings Back Memories of Dad. On my day off on Wednesday, we had a perfect weather day here in Cleveland and I debated, should I go to the zoo or take Abby to the park? The zoo won and I had a wonderful time taking pictures of the beauty of fall and I joined Abby and Gerard on the evening walk before going to my Love and Respect class. It was one of those days I hated to see end, in spite of having to take out an hour to go for a bone density test. If it hadn't been for that though, I would have been stuck inside at work most of the day! I came across this cute photoshoot about cats and pumpkins over at Words, Words, Words called Naughtiness and Non-Cooperation that I hope you will check out after I spent about four hours trying to find it again to share it with you here. Out of desperation, I wrote a post asking for HELP! Okay, I knew the tab was there but really never used it before. Kathy over at The Junk Drawer suggested I try it and just 20 minutes later, I found that post mentioned above. What a time-saver when you are trying to find something you read days before! Thanks, Kathy! 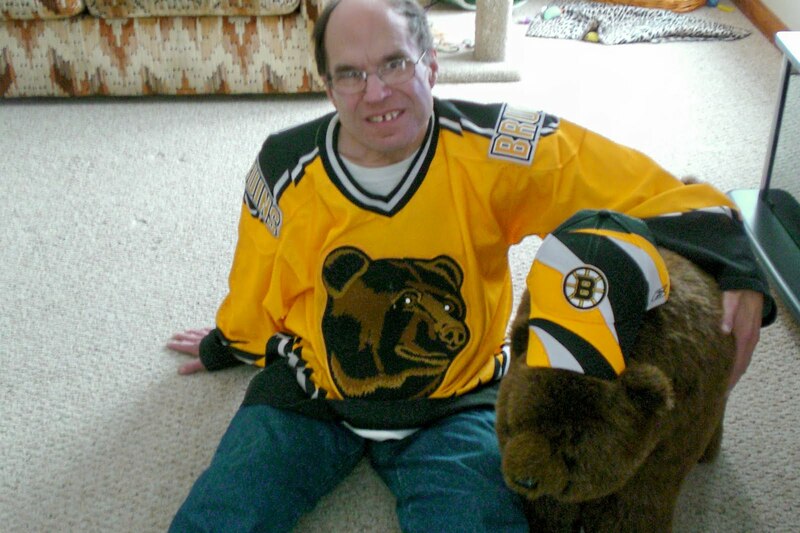 I really miss the Bruins playing hockey! The only bright side to this is that we are saving on our DirectTV bill. Taylor Swift has a new CD out. I love her music! I am listening to my first audio book in the car on my way to and from work. I love it! 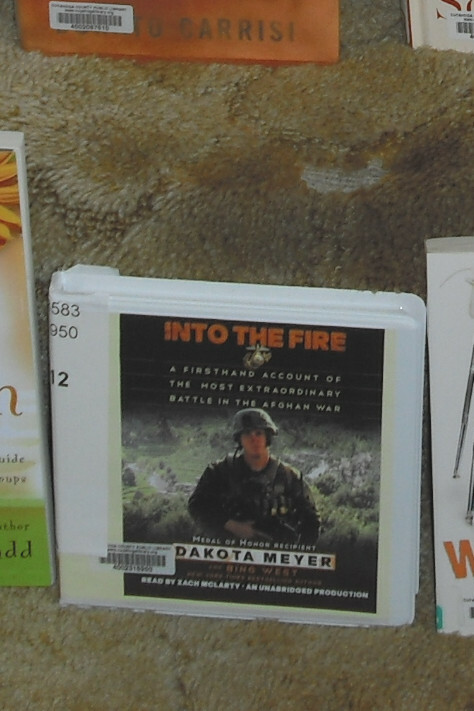 Audio books rock! Karen doesn't care for them. Do you use them? NEWSWEEK magazine has decided to go all digital. Newspapers and magazines will soon be all gone. This is sad. I hate the new NFL overtime rule where both teams have to get the ball. It takes the excitement of the sudden death out of it. Our vet offers laser therapy for dogs that is supposed to help lessen the pain of arthritis. Has anyone tried it on their dog and do you think it helps? Do you think all these presidential debates are really needed? I think most people will not be swayed by who won or lost the debate. Am I right? I don't bother watching at all, do you? 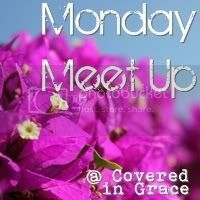 I chose this as my best post of the week for Monday Meet Up linky party. Just a few days ago I came across a really cute post about a blogger deciding to do a photoshoot with cats and pumpkins. She had cute pictures up which showed the cats being uncooperative and being distracted by a leaf. One stayed on the porch and wouldn't even come over to the pumpkins. Finally, she resorted to taking a shot of a bunny rabbit with the pumpkins. I thought I linked to it somewhere and thought I added it to my blogroll. I wanted to give it a shout out on my Friday Fragments this week, but when I went back to find it, I couldn't after spending two hours looking for it. ARRGH, where was that? Anyone else know? I tried all my new blogroll additions, checking out the blogs of new commenters, Googling it, checked my Facebook and Twitter pages for it, looked back through some of the Camera Critters, Monday Mischief and Pet Pride blog hops and came up with zip. I think it had a black background, but I'm not positive. I can't remember the blogger's name or the blog name. By doing this post, I'm showing how desperate I am, I know. It's a long shot, but can anyone tell me where I saw this? I can't remember the title of the post either. surprise! Surprise! It is such a cute post and so well done that I really wanted to share it. Two cats discovering the coats that we are donating. Spunky Doodle Burrowing in, Manny watching. Manny is "King of the Hill"
Find more pet posts at Pet Pride. This is my most favorite game to play. I like chasing a little wad of paper on the bed, or a string is good too, but it's even more amusing for me to knock it off the counter and watch my CPA (Cat's Personal Assistant) fetch it back for me to knock it off again. We played this for a good five minutes Sunday morning before church. What games to you like to play? I hope all of you make time to play--it's very important! 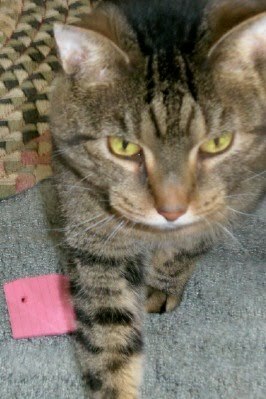 We are joining the Cats on Tuesday blog hop today. We are Ohio State Fans at our house and enjoying watching them win, win, win every week! They have been in some very close games as well as some blowouts, but last week was miraculous! Gerard DVRd the game to be sure we could see it. 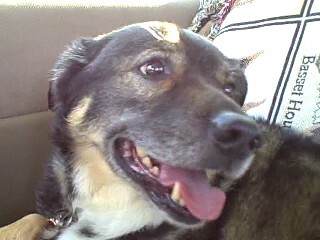 We had a busy day, first visiting the nursing home with Abby, and then Gerard took her to the groomer. I was watching at home and giving him the play-by-play report over the phone. The Buckeyes were down by 8 points in the last few minutes of the game and their first string QB was out injured. Their backup QB did a tremendous magic trick, by getting them down the field and into the end zone, but then they needed a 2-point conversion just to tie the game--they got it! The fans went wild and with just 3 seconds left, the game went into overtime. The Buckeyes got the ball first, went down and scored a TD right away! Then their defense came through, keeping Purdue from scoring. What a game! Go Bucks! Thanks for the great entertainment! I enjoyed watching the Browns game but once again was disappointed. They lost 17-13 to the Colts. Yes, they missed an extra point which was very sloppy, the snap was good but the holder let the ball fall. IF they made that, they could have tied the game with a field goal. IF the player who got called for holding twice on a good kickoff return by Josh Cribbs didn't do that, the Browns would have had two good field positions. IF the Browns rookie didn't go false start when the Colts were ready to punt, that may have saved a score--I really don't remember if the Colts scored on that or not, but they got a first down out of it. If the sun didn't get in the eyes of the Browns receiver who almost caught a TD pass, the Browns would have been ahead 19-17. I have to give the Colts credit though for managing the time at the end very well. By the time the Browns got the ball, there was only 1 second left on the clock. They had a fun last play though, tossing the ball laterally and back several times until Weeden finally missed it, but the time had run out. Once again, it was a game the Browns could have, should have won but did not. After last week's win over Cincinnati, I let my hope rise up again, only to be crushed. It's tough being a Cleveland fan. I'm still hoping we can win some more this season. I asked Gerard what the term "play action" meant. To me it seems like every play is play action, right? Wrong. He said it is when the QB fakes a hand-off to the running back but throws it instead. OK. It still seems like a dumb term to me. "Feel free to tackle someone!" "HOLD 'EM ALREADY! Every stupid time they give it to them. IDIOTS!" Two minute warning, game tie, Patriots get the ball and fumble. "How stupid. They're going to blow another one!" Jets are held to a field goal and the Patriots answer back with one of their own sending the game into overtime. Patriots get a field goal so go up by 3. "COME ON DEFENSE, HOLD THEM NOW!" That's a fumble! Call it right! As for our little football pool between my hubby and me, hubby picked 4 out of 5 games right, I had only 1 right--Gerard wins again so gets to choose where we go for breakfast this Saturday! Our day started off by Gerard choosing Cracker Barrel for breakfast which was absolutely delicious! We both got the apple French Toast breakfast. He won the football pool between us so he got to choose, and he couldn't have made a better choice in my opinion. It is my favorite restaurant. Here is a collage of the gifts we gave each other, including a card and nightshirt from the pets! I felt overdressed for a Saturday. Hope you has a wonderful sweetest day too! I know a lot of people do not celebrate this, but I think it's nice to do a little something special to remind your mate that you are still important to them. I think primarily it's more for the guys to give something to their sweethearts, but I like to give my hubby a little something too! Oh, even Abby and the cats got a special treat! This is worth getting up for! 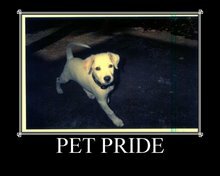 We used this for our Bozo's Pet Pride link up. We have great pets who give me gifts! Photo Editing Discovered picmonkey.com at the Creekside Cottage Note Card Party post. 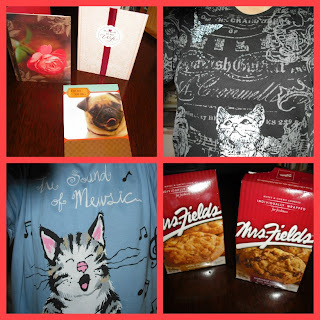 I participated in the Note Card Party blog hop this week for the first time and found lots of new blogs! This one is the third Wednesday of the month, not every week. Whew! Love that the Detroit Tigers defeated the New York Yankees and are heading to the World Series. We are rooting for them! C'mon Tigers, go all the way. I am so happy the Browns finally won a game last week! Hope they can win the next two and get some momentum going in the right direction. Looks like we'll be getting another new head coach soon. Oh, and what's with the Patriots??? That was just terrible losing that game last week not holding on to their lead!!!! We are doing the Not a Fan (but committed follower) study at church which involves journaling, viewing a DVD each week and discussion. I was surprised to see the NOT A FAN on TV--on one of the religious channels at 4 a.m. on Monday. I DVRd it just to see if it was the same thing as we were doing, and it is! Have you done this study? I recently discovered some wonderful children's books that I enjoyed very much too! They were by Pete the Cat! That's right, a cat. He co-authored three books with his mom, Peg Kehret that are very fun reads with suspense. I think any kid (or adult for that matter) who likes cats would absolutely love these books. They are The Stranger Next Door (about arson), Spy Cat (about burglary) and Trapped (about animal cruelty which is my favorite of the three). You can click to links for my reviews. Both my cats highly recommend them! Remember, tomorrow is Sweetest Day--surprise your sweetie! This is a blog hop hosted by Vee that I am participating in for the first time. All you have to do is choose 4 of your pictures that appeared on your blog before that would make good note cards. Then, visit others in the blog hop of course! Part of Camera critters too. See that picture by the phone? It's of my humans' wedding party in a garden. All is calm and quiet but then . . . Crash! Oops, notice what is missing in this picture? The little picture that belongs by the phone. When my mom was calling in her refill, I jumped onto the dresser to help and the phone slid into the picture, the picture fell behind the dresser, mom wasn't happy. The next day, she thought she could get it by taking the drawers out--the dresser is heavy to move. As soon as she took out that bottom drawer, I went in to see if I could get the picture back for her but I couldn't, so just enjoyed the small pace and did a bit of exploring. Mom was getting impatient with me so Manny came over to try getting me out. I waited for him to leave and then came out on my own. I didn't want him to get brownie points for helping mom. Now my mom moved the picture to the other end so this won't happen again. My mom likes to try to keep me out of trouble. I'll see what I can think of next. 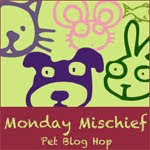 Participating in the Monday Mischief blog hop and Pet Pride. Be sure to visit other mischief makers too! When we were walking in the park one day, two girls were walking their dog too, which I thought was a pug. When I pet the dog and said I like pugs, they told me it was a bulldog. This inspired me to look up the difference. I found that Pugs are wrinklier and have curly tails. 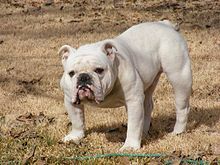 Bulldogs are more muscular looking with straight tails. 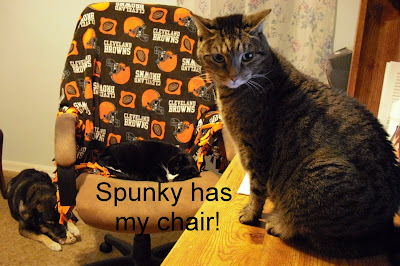 I don't know how it happened, my Monday Mischief post about Spunky Doodle and the night klunk showed up three times! I did not intentionally post it three times although I did edit it. Very strange. I deleted two of them and combined all the comments in the one I kept. 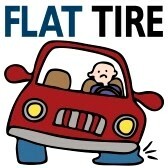 Thanks to the guy who let my husband know his tire was going flat on the way home from work on Tuesday. He dropped it off at Parma Tire on his way home, they patched it up and didn't even charge him! We picked it up when I got off the bus an hour and half later! Thanks, Parma Tire! I think the most helpful post I read this week was "The #1 Key to Getting Paid to Do What You Love" The key is "being willing to take action despite your fears and excuses." Makes a whole lot of sense to me. When playing Freekibble today, I discovered why Moe used to lick my hair and why Spunky Doodle does now: Cats lick your hair due to a natural need to groom loved ones, to show affection & they like the taste of natural oils in your hair. I still have my doubts though because it seems like they bite it more than lick it. This shows how one small act of kindness can go a long way. I just discovered this one over at It's Just Life this week, but added it to my favorites! Another kind act but funny too--love Beth Moore's humor! We can't forget about a dog one--this is funny! Actually, I didn't have this one in my favorites, but remembered seeing it on God Vine so searched for it and found it. This one is so touching and inspirational, he was so brave to go on the show and boy, can he sing! You may have seen some of these before because I know I posted at least three of them here and others of course shared some too. I'd be curious to know which one you like best! I think there's something here for everyone to enjoy. Notice I didn't post any of my own but invite you to visit my YouTube channel. Just click on the "videos" tab at the top. This is inspired by Mama Kat's Writer's Workshop prompt to share 5 favorite videos. Yes, I know I listed six but the last one came to mind so I wanted to include it too. It may look like a kid did these, but it is my work (I like color)! I like easy crafts and it doesn't get much easier than this. Everyone got to make two. While some of the group was doing the craft, the rest were eating. Some of the letters got cut off when I stamped it but used the black watercolor pencil to fill them in. Once you stamp it, you can't stamp over it and get it lined up perfectly, I tried and the craft lady was kind enough to give me another one. I really liked using the watercolor pencils--I wasn't sure you could tell. Once we got the stamp on and the color we wanted, one of the committee ladies sprayed them for us outside to seal them. We did this right at the beginning of the meeting so they would have time to dry. The Bible study part was good too. We are reading Power of a Positive Woman by Karol Ladd. The discussion was on being created for a purpose and how faith chases away worry. We had a good discussion at our table and laughed a lot! The time flew by. I am a clock watcher, and I know that if I am at a meeting that lasts 2 1/2 hours without looking at the time once, I am having a good time! Next month we will be putting together some food baskets for delivery to people in the church who are struggling financially. I think they said we'll be putting them into our food pantry. The baskets will have items for a Thanksgiving meal.